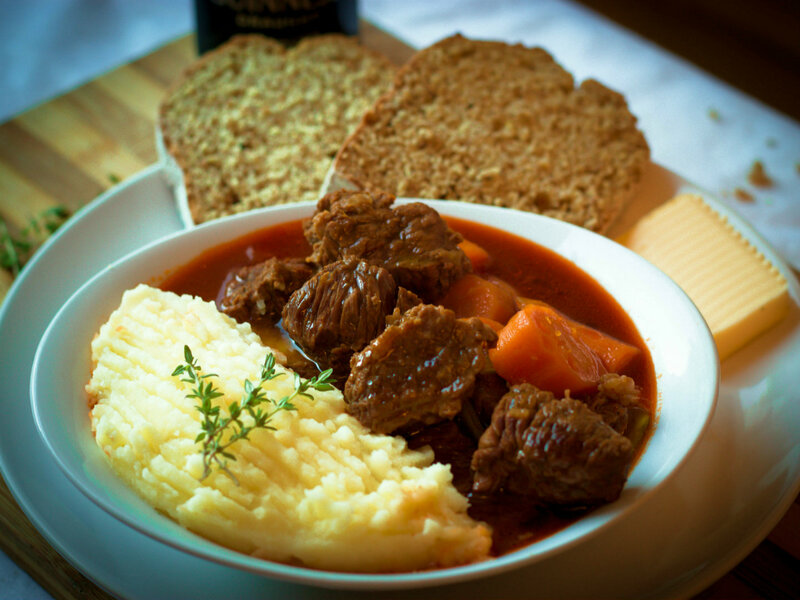 The national dish of Ireland is probably the famous Irish stew (the other possible choice would be Colcannon). Why not enjoy it on St. Patrick’s Day (17th of March 2015). Stewing is an ancient method of cooking meats that is common throughout the world. When the Celts invaded Ireland they brought the first bronze cauldrons, copied from Greek models, which then became the dominant cooking tool. The use of potato in the stew, did not occur until after the sixteenth century when seafarers brought the crop from the New World. Enjoy the recipe made by Paula, our country chef from Ireland. Chop the onion and garlic. Chop the tomatoes and celery. Cut the carrots and parsnips into chunks. Heat the oil in a large frying pan, add onions and garlic and cook for 3 minutes or until they are translucent. Cut beef into large chunks then add beef and cook over high heat, until the meet has browned. Stir and add salt, tomato purée, tomatoes, carrots, celery, parsnip, water and beef stock. Stir and pour everything in a casserole, add beer, thyme and rosemary. Bring the stew to boil and reduce heat. Simmer slowly for 1 1/2 hour until tender. Place potatoes in a large saucepan; cover with water. Bring to a boil. Reduce heat; cover and simmer for 15-20 minutes or until potatoes are very tender. Drain well. Add the butter, milk and salt; mash. Paula Yasbeck was born in Brazil with Lebanese roots. She has lived in Ireland for almost six years. Paula’s interest in cooking comes from growing up in Brazil, where all the family meetings happen around the dinner table with loads of good food. Living in Ireland, she has not only come to know many great people, but found an interest in the Irish food. The recipe she shares here is one of the most famous Irish dishes both in and outside the country.